Successfully Added MINIX NEO C Type-C Multiport Adapter - 2x USB Type A, SD + Micro SD Slots, HDMI With 4K Support (Gray) to your Shopping Cart. Deigned especially for the MacBook this stylish multiport USB Type-C adapter unlocks the possibilities of your MacBook with great backwards compatible connectivity for all yout peripherals. The MacBook has one major drawback, and that the solitary USB type C port. Chances are you still have plenty of devices that need to use those USB type A ports, like your phone, music play, mouse and memory pens, and many more peripherals. Well the MINIX NEO C Multiport Adapter is here to help. 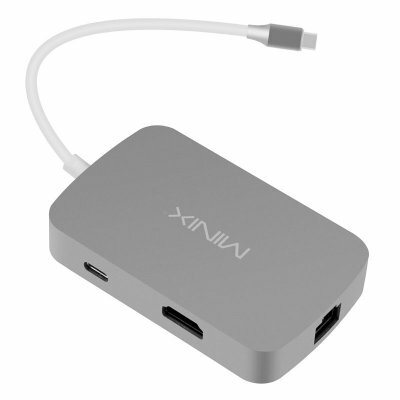 Sporting two USB Type A ports as well as HDMI, Ethernet, SD and micro SD slots this multiport adapter from MINIX will unlock the potential of your MacBook for better connectivity at home or on the go. Letting you connect to all those old peripherals, with backwards compatibility, Gigabit Ethernet support and the ability to charge your MacBook at the same time this all in one adapter is answer to your prayers. With 4K support the HDMI port lets you add an extra screen, projector or UHD display to your MacBook so whether its watching movies, sharing a presentation or easier multi-tasking you have all the options covered.